A minister’s personal spiritual formation involves their sharing in Jesus’ righteousness, peace and joy in the Holy Spirit (Romans 14:17). This sharing is enhanced as they are nurtured within environments where Jesus’ love and life are encountered, leading to them developing various aspects of Jesus’ character (his virtues). This correspondence between environment and virtue is unpacked below. For example, an environment where God’s love is experienced tends to yield the virtue of being grace-based. In each section, resources are recommended to provide information and instruction concerning each virtue/character attribute. As ministers experience an atmosphere expressive of God’s unconditional love, they increasingly relate to God on the basis of his provision in Christ through the Holy Spirit. This produces within them a heart for and commitment to relationships that are based in grace rather than in human performance, or in a desire for personal power or gain. Wholehearted: Finding Personal Wholeness in Jesus – by Cathy Deddo. The Relational Pastor – a book by Andrew Root. As a minister experiences joy and awe in knowing God as Father, Son and Holy Spirit, they learn to trust in and live for God through loving allegiance to Christ their Lord. Ministry in the Image of God – a book by Stephen Seamands. A Passion for Christ, the Vision That Ignites Ministry – a book by TF, JB and DW Torrance. As a minister is immersed in God’s story of creation and redemption, conveyed through the written word (the Holy Scriptures), they will, through the Holy Spirit’s illumination, increasingly have their hearts and minds molded by and conformed to Jesus, the living Word. God’s Big Picture, Tracing the Story Line of the Bible – a book by Vaughan Roberts. Scripture God’s Gift by Gary Deddo. As a minister, through the spiritual disciplines, draws close to God, they are embraced by the transforming presence of the Holy Spirit. Out of this spiritual formation flows whole-life stewardship that bears the fruit of the Spirit rather than the works of the flesh. After You Believe, Why Christian Character Matters – a book by N.T. Wright. Celebration of Discipline, the Path to Spiritual Growth – a book by Richard Foster. As a minister experiences a hope-filled and expectant vision for ministry, they develop a deep and abiding sense of calling to active participation in the local church. This participation emphasizes mutually accountable relationships through the collaboration of team-based ministry. This approach to ministry also reflects Christ’s concern for the well-being and involvement of the minister’s spouse and children. Worship, Community and the Triune God of Grace – a book by J.B. Torrance. As ministers experience commitment to the Great Commission with a Great Commandment heart, they are emboldened to build redemptive relationships, through which disciples of Jesus are multiplied. For a detailed presentation on disciple-making with related resource recommendations, click on the DISCIPLE-MAKING COMPETENCY tab above. Participating with Jesus in disciple-making ministry necessitates development of competency in various areas of ministry. Disciple-making churches prioritize training their workers and leaders to help them develop these competencies. 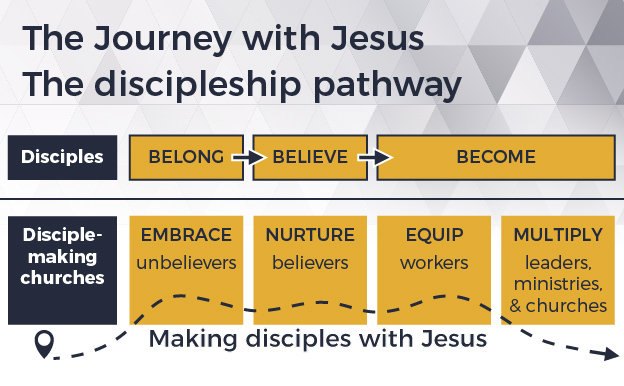 For resources to use in this training, watch the 21-minute video below, and review the information presented under the BECOME tab on the DISCIPLESHIP page.